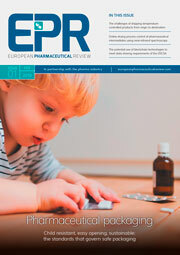 Lyophilisation of biopharmaceuticals Freeze-drying or lyophilisation1,2 is often the method of choice3,4,5, especially for converting aqueous formulations of labile biopharmaceuticals into stable, re-dissolvable solids. Basic monitoring of the process conventionally relies on temperature and pressure measurements. Although it has been well established for decades, there is still room for optimisation in all stages of this complex process (Figure 1; page 51). For example, scale-up processes are often addressed in an empirical manner. Changing this, however, would require reliable process information, preferably in real time, most importantly about the true moisture content of the samples. In principle, all analytic methods today either monitor individual vials, for example, by determining their weight, or check the moisture contents and flow within the freeze dryer as an integral value. The latter is done by determining partial pressure of the water vapour or the water concentration in the gas, for example, by using infrared absorption spectra obtained with tunable diode lasers (TDLAS)6. 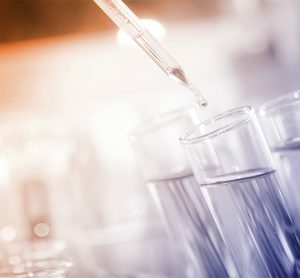 In recent years, various attempts have been made to employ spectroscopic methods to directly conduct moisture measurements in individual vials. 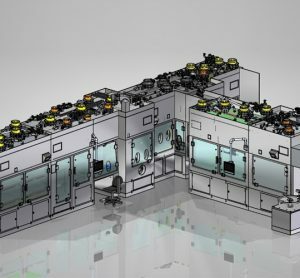 However, as the temperature distribution in the freeze dryer is not totally homogeneous, each vial is treated as an individual which makes it difficult to obtain reliable data even on an average basis. 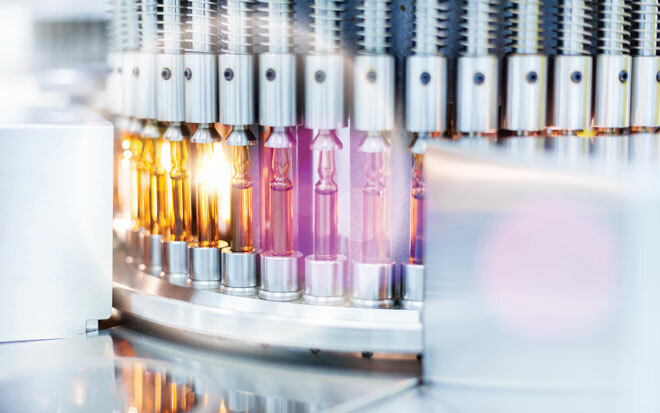 Nevertheless, the pharmaceutical industry is highly interested in having a precise understanding and monitoring the complete lyophilisation process because it is critical for the final product quality. 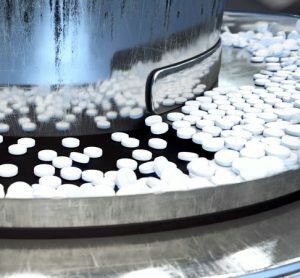 Such a ‘quality by design’ approach7 has become a key requirement in pharmaceutical production. Melting of the vial contents or collapse of the lyophilisate has to be avoided since it would be detrimental to the product. In order to monitor lyophilisation in an optimal way, a continuous stream of information along the whole process would be required. Spectroscopic analysis has become a preferred tool mainly as a result of the PAT initiative of the United States Food and Drug Administration[i]. For lyophilisation, Raman and NIRS have been widely investigated. They are fast, non-invasive, non-destructive and do not require any sample preparation. However, calibration with the reference method and data analysis is required in most cases[ii],[iii], as well as validation[iv]. According to De Beer et al. [v], Raman data tend to provide more information about the freezing step, whereas NIRS data is more accurate for the actual drying phases. As early as 1989, Kamat et al. [vi] reported the residual moisture determination in lyophilised sucrose using NIRS. Lin and Hsu[vii] determined residual moisture in lyophilised protein pharmaceuticals by NIRS with a precision comparable to Karl Fischer (KF) titration, that is, with deviations of less or equal 0.5%. Savage et al. [viii] employed NIRS along with loss on drying and KF to determine adequate moisture content for efficient viral inactivation in lyophilised Factor VIII. With a focus on the active ingredient, NIRS was employed by Remmele[ix] in 1997 for real-time in situ monitoring of lysozyme during lyophilisation. Early work identifying reflectance NIRS as a useful in-line tool to identify endpoints of the freezing and drying phases during freeze drying of polyvinylpyrrolidone solutions, dates from 2003[x]. Understanding how lyophilisation proceeds within a single vial. Reflectance NIRS measurements have been conducted which employ a Bruker six-channel F-Matrix spectrometer and a pilot-size lyophiliser (special equipment based on a device from Hof Sonderanlagenbau, Lohra, Germany). To detect the endpoint of the primary drying phase, it is necessary to be able to distinguish ice from liquid or adsorbed unfrozen water in the spectra. According to literature findings[xvi], this is possible by analysing NIR spectra in the wavelength region between 1 and 3µm. To address the first challenge, a special flange has been designed as a vacuum-proof fiber-optic feedthrough into the lyophiliser without compromising temperature distribution and pressure levels. Small ensembles of seven vials (Vial 10ML-CL, Schott, Mainz) were set up in order to create a realistic environment for the central vial with a probe which is placed directly adjacent to the vial’s sidewall. The couple of vials were held in position by a Teflon collar affixed to the upper part of the outer-sphere vials. Fibre optics were led to the outer surface of the central vial by means of a Teflon block (Figure 2, photo; page 00). Endpoints of the primary and secondary drying phase according to the second challenge could be determined from spectra taken in the range from 1,000 to 2,200nm every six minutes per measuring point. Depending on the position on the freeze-dryer shelf, a parallel shift of the moisture content curves was observed, covering a time window of approximately one hour at maximum. This time defines the uncertainty of the primary endpoint with respect to the vial position on the shelf, as expressed in the third challenge. Unfortunately, due to strong absorbance of the ice at the beginning of primary drying, no meaningful information about the moisture content in the vial could be obtained at an early phase of primary drying, as indicated by the oscillating absorbance. The endpoint of secondary drying at about nine o’clock on day two is identified by a much smaller decrease in total moisture than primary drying. The significance of this decrease, however, has been demonstrated by sealing the vial at position F2 after primary drying as a reference. As expected, its moisture content remains almost unchanged afterwards. The fourth challenge has been addressed by an experimental setup whereby a single sample vial has been equipped with six individual NIR probes at equidistant, vertically aligned positions at the sidewall of the vial (Figure 3; page 00). Again, no evaluable information could be obtained for early primary phase drying. Afterwards, the moisture concentration curves are spread out depending on the detection location at the vial. For a given point in time, i.e., 11:45am at day two, all six measurement values are shown in the graphic which has been superimposed on the photograph. As expected, a continuous decrease of moisture values is observed from the bottom to the top of the vial’s contents. As the drying process proceeds, the curve flattens out more and more until it reaches zero moisture at all positions. This provides another independent indication for the endpoint of secondary drying. By dividing the integrated moisture content into two equal halves, a weighted average has been identified to be located at position F3, 3.5mm above the bottom of the vial. This detection position is therefore ideally suited for obtaining a mean value of the drying progress within the vial. In order to address the lack of information in early primary drying, it appears promising to investigate transmission NIRS using overtone absorption bands, as already indicated in a recent publication[xvii]. As obvious from Figure 4 (page 00), ice and water become clearly distinguishable by their absorptions at 1,025 and 980nm, respectively, which are almost completely separated. This would allow for quantitative moisture monitoring, not only of early-phase primary drying, but also of the nucleation and freezing process, which is of great interest for practical pharmaceutical lyophilisation. However, spectra have so far been obtained with a tec5 MultiSpec system (tec5, Oberursel, Germany) equipped with a tecSpec LS-H halogen light source and a tecSpec SC-MCS multi channel spectrometer module (Carl Zeiss, Jena, Germany) only after severe baseline correction and smoothening. This was due to extremely low transmission and low sensitivity of the standard InGaAs detectors that have been employed in these preliminary experiments. Unfortunately, the sensitivity of these detectors drastically decreases below 1,000nm. Up to now, no detector with appropriate characteristics could be identified. Reflection NIR-measurement at a height of approximately one third of the filling level of the vial yields a reasonable mean moisture value for the prediction of the progress of the overall drying process for the vial. Further insights into nucleation, freezing and early primary phase drying could arise from transmission measurement of short-wave NIR/VIS overtone spectra. Detectors with improved sensitivity between 900 and 1,100nm would be required in order to obtain reasonably precise data. The ultimate solution for dealing with inhomogeneous temperature distribution and ‘edge vial effects’ during lyophilisation, could lie in an imaging method that determines the moisture content of all vials on a shelf, simultaneously. However, this is nothing more than a vision at present. Adrian Funke is a pharmacist by training. He has served as a Senior Scientist in formulation development for more than 10 years. Since 2012, he has been Head of Process Science within Chemical and Pharmaceutical Development at Bayer Pharma AG, responsible for QbD and PAT implementation. Reinhard Gross is a physics engineer. He is a Senior Expert for PAT-application and PAT-development topics at Bayer Technology Services GmbH. Due to his long term experience in different areas of PAT he has a sound and comprehensive PAT expertise. Stephan Tosch studied physics at the Ruhr-University of Bochum. He worked for 23 years in the field of PAT before becoming the leader of the PAT application team. Today he is Senior Expert for physical characterisation in the technical development of Bayer Technology Services GmbH. Albert Tulke is a chemist. He is leading the PAT Solutions Group at Bayer Technology Services GmbH. Previously he was laboratory- and group leader for corrosion and failure analysis. Before joining BTS in 2009 he gained long-term experience working in the field of analytics, corrosion and failure analysis.